If there’s one thing that I love in this world, it’s having radiant skin. I want my complexion to shine like the top of the Chrysler building and blind people with my beauty if they try to look at me directly. So it probably goes without saying that highlighter is one of my all-time essential beauty products. A good highlighter is a truly crucial beauty product, and I have several favorites that I keep in my every day makeup rotation. And while they all have different formulas, applicators and finishes, the one thing they tend to have in common is that they’re expensive. Hey, when it comes to my skin, I’m only going to use the best. But here’s the good news: you don’t have to spend a fortune to get an amazing product. There’s a drugstore highlighter that gives a luminous glow so good that it rivals even the priciest product in my (extensive) cosmetic collection. But the weird part? It’s technically not even a highlighter at all. 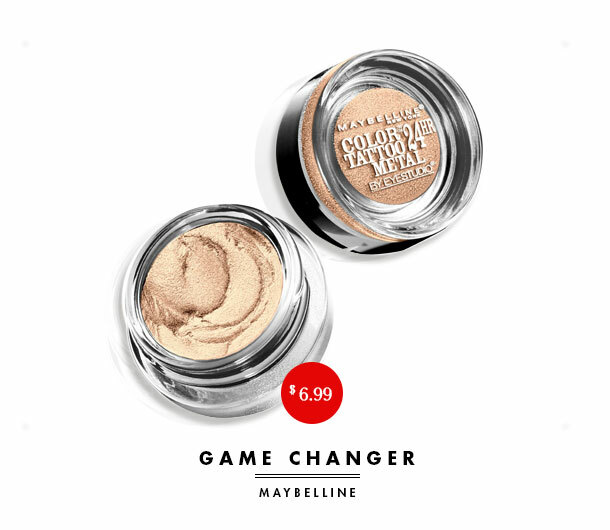 Allow me to introduce you to Maybelline Color Tattoo Metal 24hr Cream Gel Shadow in Barely Branded ($7), the eye shadow that is actually the world’s most perfect cream highlighter. As a shadow, I found that it was prone to sinking into lines and creases…but on my skin? It’s perfect, and lights me up like a candle. To begin with, it’s the world’s most perfect color. Barely Branded is a soft beige-gold that works on literally every skin tone. If I’m asked to do makeup for a wedding, this is the highlighting product I reach for 99% of the time, no matter the skin tone of the bride. It is universally flattering. It also gives the perfect amount of shine. Metallic but not TOO metallic, it’ll give your skin natural radiance without making you look like C3PO. You can also blend it well for a more subtle shine, or layer it for more dramatic impact. I like to do a combination of the two because, like I said, I require maximum radiance at all times. Don’t judge me. It’s incredibly easy to apply: you literally just dab it on with your fingers and tap to blend. No brushes to clean or complicated highlighting techniques to learn? Yes please. And unlike a lot of other cream highlighters, once this product sets, it lasts. Raise your hand if you’ve abandoned cream highlighters because they never fully adhere to your skin, leaving you with those weird marks on your cheeks where your sunglasses remove the shine. Yeah, probably all of us…but not with Barely Branded. It’s perfect for sweaty summer days. But the very best part? It costs less than ten dollars, and a single jar lasts for EVER. So if you’ve been looking for a way to illuminate your skin without taking our a mortgage, this is the not-technically-a-highlighter product for you. Thanks for our perfect summer complexions, Maybelline! More from Daily Makeover: The Concealer That Will Change Your Life.